Location: The Fairhope Municipal Park is located at the end of Fairhope Avenue in Fairhope, Alabama. From I-10 take the Daphne exit (exit 35) and head south on Hwy. 98. Continue south for the next 9.3 miles on Hwy. 98 (which is also known as Greeno Rd). Continue straight onto Hwy 98 until you reach Fairhope Avenue at the traffic light with a Hardees, Ruby Tuesday, and Shell station on the corners. Fairhope Avenue takes you directly to the pier. Start looking for parking! There should be signs directing you along the way as well as racers, volunteers, and race directors to show you where to park. See the course map if you have questions. Click here for maps of the designated parking areas in downtown Fairhope. All locations listed are within easy walking distance of the race start. No parking is allowed at Fairhope Municipal Pier. 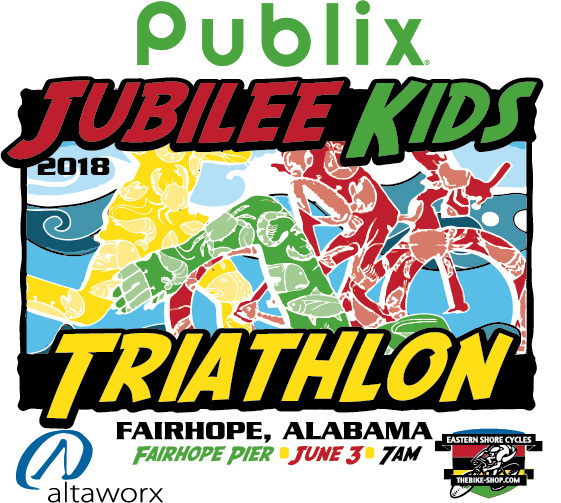 The race course is located within a residential area, so the Jubilee Kids Triathlon race hosts insist that racers use parking available in downtown Fairhope. Please do not park in residential yards or block driveways. YOUR VEHICLE WILL BE TOWED! There is no parking at the race site after the Expo Friday evening. VERY IMPORTANT: Please do not leave your car at the race site on Saturday Night or it will be towed. The area surrounding the rose garden is closed to parking beginning on Saturday, June 2 at 6 p.m. in order to set up the transition area. Does this area re-open after Grandman and close again?